In Thursday night’s “undercard” debate, the one you didn’t watch, a group of dispirited aging Sears models wandered around a vast, icy, blue-lit stage, begging someone to notice them. Among them was Carly Fiorina, who loves her husband and would like some extra credit for it. “I’m not a political insider. I haven’t spent my lifetime running for office. The truth is I have been blessed by a lot of opportunities to do a lot of things in my life. 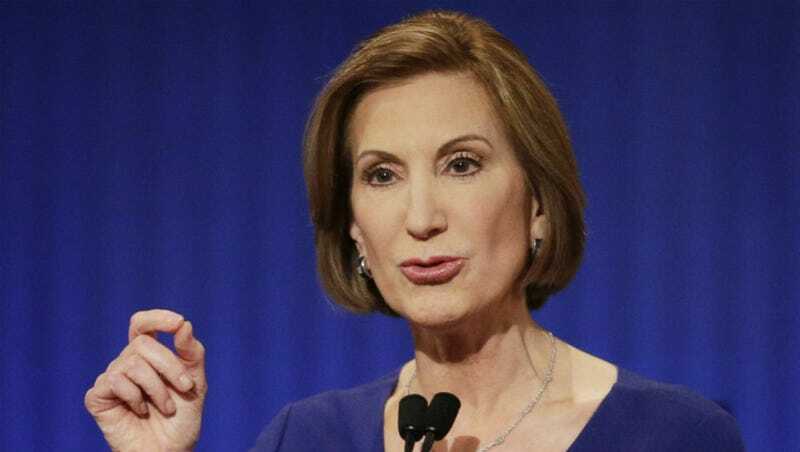 And unlike another woman in this race, I actually love spending time with my husband,” Fiorina said. Everyone please note Carly Fiorina’s love for her husband Frank and consider it when making decisions about any future debate lineups.